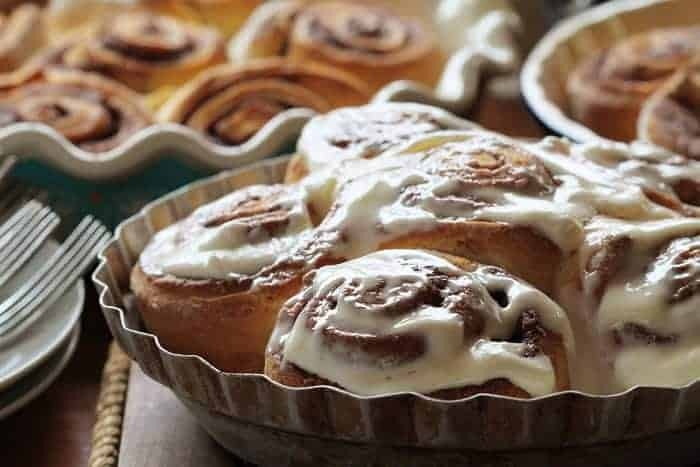 Making Cinnamon Rolls has never been easier nor more delicious! 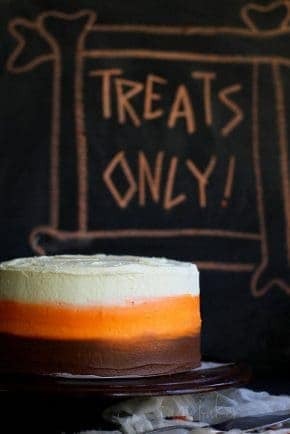 Paired with my Copycat Cinnabon Icing and breakfast will be a little bit of heaven! You may also like my Glazed Donuts, Blueberry Breakfast Cake, or even Chocolate Chip Banana Bread! 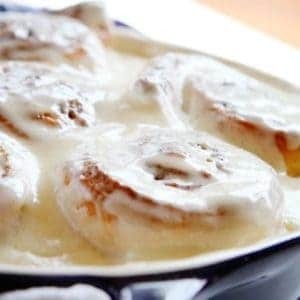 I am ALWAYS craving cinnamon rolls but too lazy to make up a batch and wait for hours or heaven forbid, overnight. What is my secret? Store bought pizza dough. The kind the comes in a long tin and POPS open. It works BEAUTIFULLY. 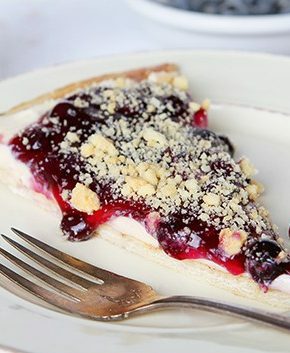 I have tried it with both the regular crust and thin crust. I prefer the regular pizza dough, my husband preferred the thin crust as he likes a crispier roll. Recipe adapted from Pumpkin Pie Cinnamon Rolls. Tips and tricks on how to make rolls also at the link! The real beauty of these rolls is the icing. I spent a LOT of time trying to replicate Cinnabon’s amazing icing recipe and I think this recipe is it. The trick? Whip it in your mixer for the recommended time. It is worth it! You can definitely make from-scratch pizza dough in this recipe. Just make it the night before and chill until ready to assemble! Just in case you don’t have any store-bought dough on hand, here is a quick recipe. It takes about 15 minutes and you are ready to assemble! Stir in flour, salt, and oil. Beat until smooth. Let rest for 5 minutes. Turn dough out onto a lightly floured surface. Roll to 1/4 or 1/2 inch thick. Continue on with instructions in the recipe below. 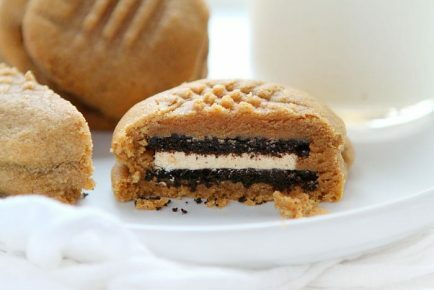 So FAST and EASY, no one will ever know they are semi-homemade! Heat oven to 350°F (or 325°F in a convection) and prepare an 8 or 9inch round pie dish with bakers spray, goop, or parchment. In a small bowl, combine brown sugar and cinnamon with a fork. Rub 3 tablespoons butter over dough so that it covers entire surface. Spread brown sugar and spice mixture over dough making sure it covers entire surface. Starting at the edge that is 6inches long, roll up dough. While rolls are baking put cream cheese, butter, confectioners sugar, vanilla, and salt in stand mixer fitted with paddle attachment. 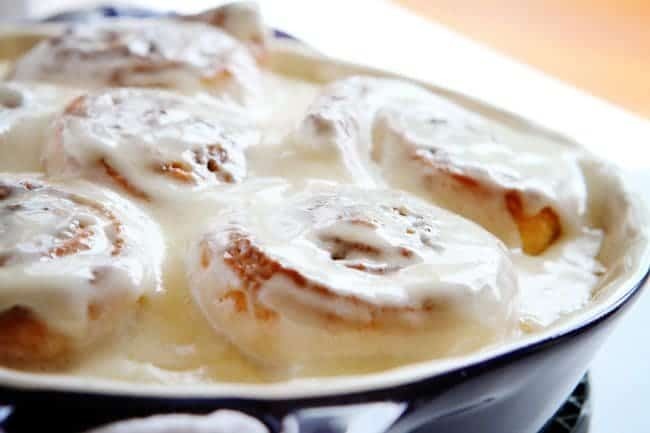 These are definitely “to the point” cinnamon rolls! A total saviour when you want these beauties on a busy morning. I love your frosting! Oh I love this quick version. What a saving grace on mornings you want something decadent but don’t want to spend forever in the kitchen. Sounds like the perfect this to have while opening gifts on Christmas morning! 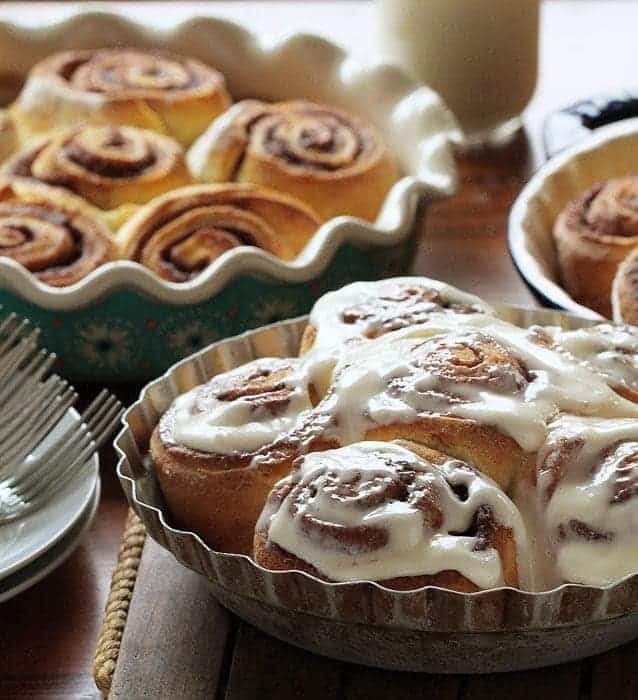 Oh what I wouldn’t give to just dive face first into a plate of these cinnamon rolls! 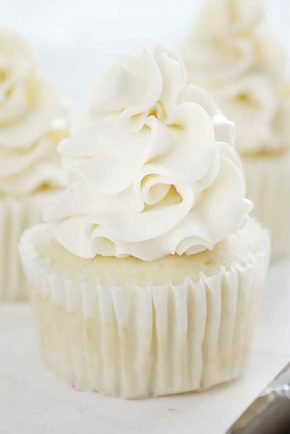 They look amazing, especially with all of that fluffy whipped cream cheese frosting! Heavenly! Me too Rosanna! Lol! Just get it all over yourself type of an experience and to eat my own weight of them! Lol! Lord I’ve just lost my mine! Lol! Lol! Genius! I love this shortcut, and that icing sounds fantastic! Yum! What a great, time saving trick! Sounds delish… we can’t buy ‘dough in a can’ here in aus… is there an alternative or shoulr I just make the dough myself? Yes, you can make a quick dough and that will work great! I don’t have that kind of dough here either. 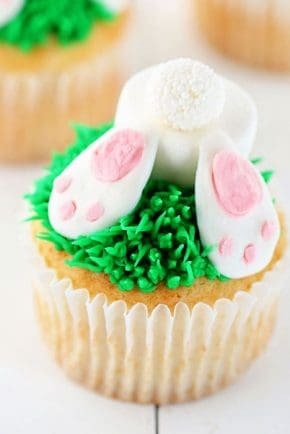 Do you think I can do this with puffy pastry? What is the goop in pan? Can you make the frosting the day before? Oh my …….. I mean, OH my ……….. I mean, OH MY!!! These are amazing!! Made them this morning for hubby and me. Best cinnamon roll I have ever had. 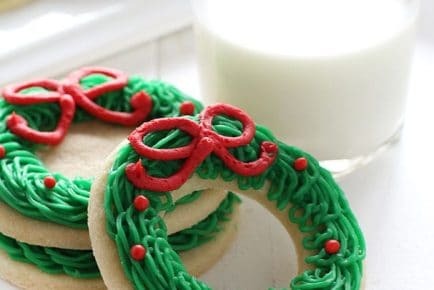 Recipe makes a lot of icing – our favorite part! Thank you so much! This recipe sounds amazing! I don’t have a paddle mixer, can I hand mix or use my electric beaters? Also, can I grease the baking pan with butter or Pam spray butter? Thanks, can’t wait to try this, my husband loves cinnamon rolls (almost as much as I do!). I do not usually leave reviews. This recipe is awesome. Just made these, literally. I’m a huge fan of the cinnamon filling so I incresed this by about 50%. For those that are icing/frosting folks, the recipe is ample as is. This is definitely a keeper!! Do u have any cool books out with the recipes u put on Facebook. I’ve tried several and love them. I made these today and it seems the amount of cinnamon should be 2 tsp not 2 tbsp as shown in the recipe. The cinnamon is overpowering and they turn out dry but the icing is amazing! Sorry you didn’t like the cinnamon, the recipe has been tested quite a few times and I have never heard feedback like yours. You can certainly use less! As far as being drying, they may have baked too long if that happened to you. I made these this morning. They are easy and soooo good! The outside rolls crisped up a bit which helped them hold up to a mountain of cream cheese frosting.